Treatment and care at The Johns Hopkins Scleroderma Center provides new insights for patients about scleroderma. The information in this section is meant to help patients understand the disease and prepare for their visits. New patients should download the patient information packet (Completed New Patient Packet) to obtain practical information about health insurance, to learn what to bring to appointments, and more. An educational program to help you understand the many facets of Scleroderma. This book chapter excerpt is an excellent resource for learning about common treatments for symptoms of scleroderma. Current therapies use medications for the four main features of scleroderma: inflammation, autoimmunity, vascular disease, and tissue fibrosis. This book chapter explains the way each treatment works. A list of questions frequently asked by newly diagnosed Scleroderma Patients. People with scleroderma can live a full life. 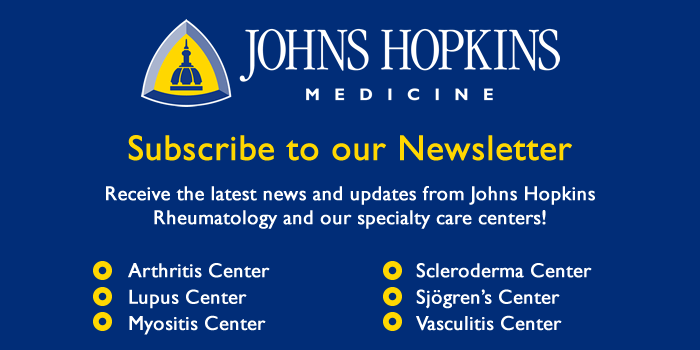 Read what patients of The Johns Hopkins Scleroderma Center have to say. Doctors at The Johns Hopkins Scleroderma Center believe that it is important for patients to understand their disease. In this section they provide additional resources for learning about scleroderma.